You're saying this all looks good, but you were really looking for more than one musician. During my many years playing in the Atlanta area, I've built quite a list of contacts among many talented musicians. If you're looking for a combo, I can bring together people suited to play the music you want to hear. Whether you're looking for classical, jazz, rock, blues or country music, I know just who you need to provide the right sound. We'll plan your music together and I'll line up the talent. Special requests? I can help you find the right people to play them. Need accompaniment for your soloist? Let's talk. My background is varied. You may want classical music or jazz, popular selections, oldies, rock, country or piano bar favorites. We'll work together to build the atmosphere that fits your party's theme. 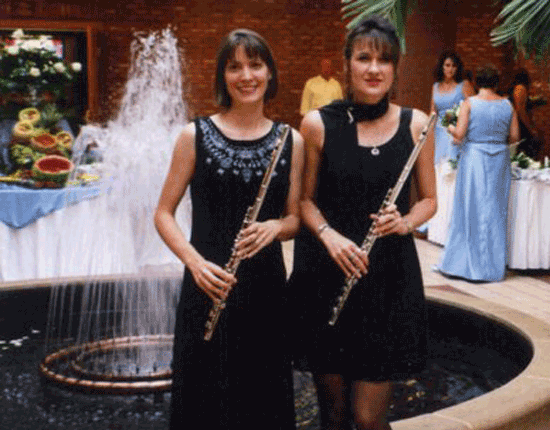 I can provide piano, flute or vocal solos for your special selections. I can also bring bass, guitar, percussion or other musicians to provide a fuller sound. I've played many times with certain talented musicians. These professionals work together often to form combos for special events. Whether you need a jazz combo, a versatile duo or trio for classical selections, a full band for oldies, rock, blues or country music, I know who to call. But remember you'll need to plan in advance, especially during the holiday season! These musicians are busy. No grand piano or in-house sound system? No problem. I own two keyboards, as well as two Bose speakers, a six-channel powered mixer, and two Shure SM 58 microphones and can bring these to your event, if needed. If you are an event planner or planning for your company, please include your job title. If you are an event planner or planning for your company, please include your company name. If you are planning for an event that is already scheduled, please enter the date. Planning for a scheduled event. Planning for an event not yet scheduled.